Fill your glorious garden scenes with a perennial backyard favorite…the Blossoming Coneflower! When paired with the coordinating cling stamp set, creating attractive and super dimensional coneflower blossom die cut embellishments is quickly and easily achieved! The creeping coneflower cluster, when utilized as a photo framing accent on scrapbook photos makes a stunning visual statement, while a slightly shaped coneflower planting adorned with dimensional blossoms is ideal for taking center stage on summer themed card fronts! 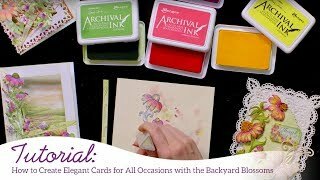 These dies are part of the Backyard Blossoms Collection and pair with the Blossoming Coneflower Cling Stamp Set.